Microbial filter-feeders actively filter water for bacteria-sized prey, but hydrodynamic theory predicts that their filtration rate should be one order of magnitude lower than what they realize. What is missing in our knowledge and modeling of these key components of aquatic food webs? In a recent study published in PNAS, Nielsen et al. (2017) used a combination of microscopy observations, particle tracking, and analytical and computational fluid dynamics (CFD) to shed light on the physics of microbial filter-feeding. 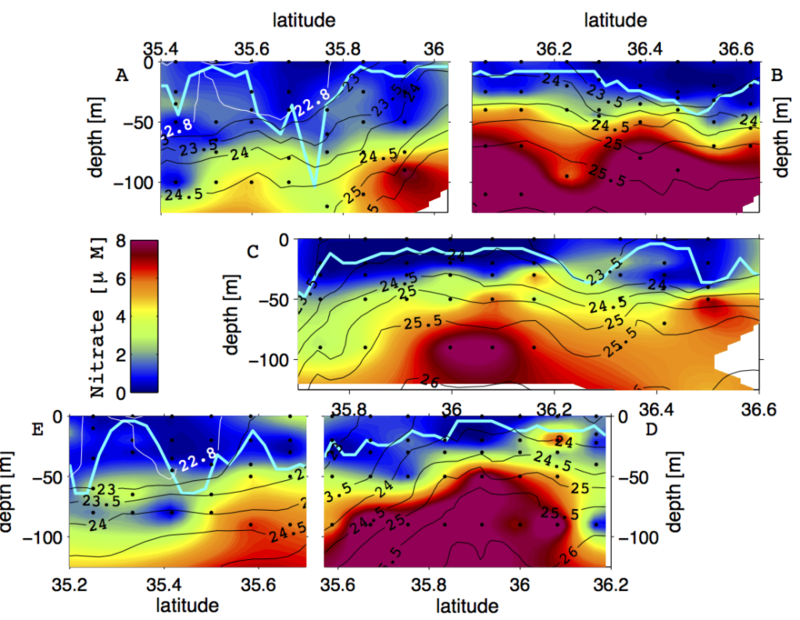 They found that analytical and computational fluid dynamic estimates agree that the observed filtration rate cannot be realized given the known morphology and flagellum kinematics. The estimates consistently fall one order of magnitude short of observed filtration rates. This led the authors to suggest that their study organism, the choanoflagellate Diaphanoeca grandis, has a so-called ‘flagellar vane’, a sheet-like extension of the flagellum seen in some members of the choanoflagellate sister group, the marine sponges. This structure would fundamentally change the physics of the filtration process, and the authors found that both the analytical and the computational estimates match observed filtration rates when such a structure is included. Left: Choanoflagellate model morphology showing the protoplast (cell) in orange, the filter comprised of microvilli (black), the lorica and chimney (red) and the flagellum with vane (blue). 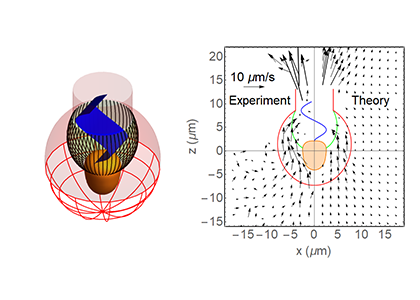 Right: Experimentally observed near-cell flow field vs. flow field modelled using computational fluid dynamics including a flagellar vane. The filter cross-section is here shown in green. The modelled flow field provides a good match with the observed flow field. 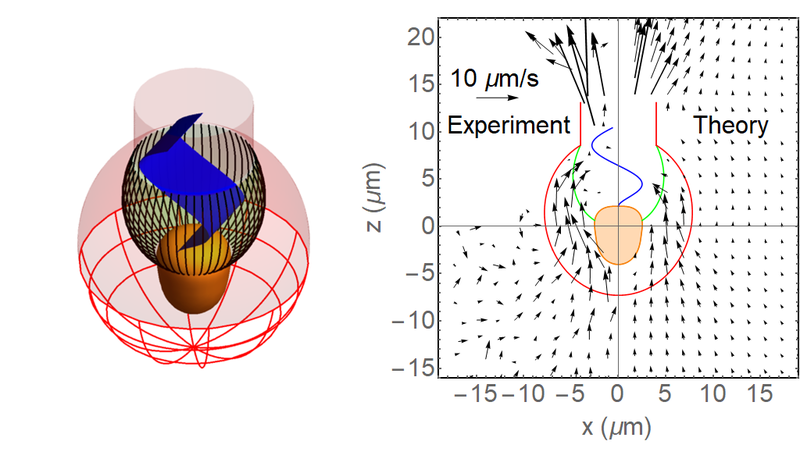 Without a flagellar vane, the model flow field is at least an order of magnitude weaker. This leads to the suggestion that a flagellar vane is needed to account for the observed flow field and clearance rate. The new insights allow the authors to generalize about the trade-offs involved in microbial filtering, which is important to our understanding of the microbial loop in planktonic food webs. The results are of even wider interest since choanoflagellates are believed to be the evolutionary ancestors of all multicellular animals, many of which include cells that are fundamentally identical to choanoflagellates (e.g., the simple cuboidal epithelium cells of kidneys). Thus, microscale filtering not only happens in every single drop of seawater, it also happens inside most animals.